Adding By Barcode: removing entries from the queue is now even easier (and easier to find). When moving your mouse over a queue entry, a small delete button will appear over the cover image. Just click it to remove that entry. Adding By Title: the “expand” arrow (for expanding the edition list) is now easier to find, as it how highlights when moving your mouse over an entry. Add Movies from CLZ Core: when sending a batch of barcodes from a barcode scanner, it sometimes did not add all barcodes to the queue. Sync with CLZ Cloud: local front cover would sometimes be replaced with the online scaled version when down syncing. v17.1.3: New: Keyboard Shortcuts to add movies and more! With this new version we added a new setting in the Add/Update Movies Automatically options screen and fixed some bugs that have been reported since yesterday. If you have any feedback about the new Add Movies from CLZ Core screen be sure to let us know! v17.0.6: Fixed a “Cannot focus window” error. Links to renew your update plan will now automatically log you into your account on the website. Check for Updates: now has a link to the “What’s New” page on our website. My CLZ Account popup: now has a link to the “What’s New” page on our website. Cloud Syncing: Now does up to 5 retries when a sync action fails because of a temporary connection problem. 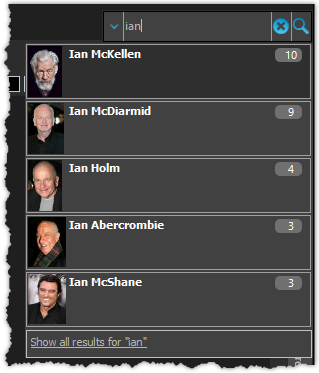 Edit Movie: Improved “search as you type” behaviour of search boxes for adding cast and crew. Dark Skin: active window now has a light grey border, making it stand out more when windows overlap. Add Automatically: adding a checked result would sometimes uncheck a result from another search in the queue. Main Screen / Two Panel Mode: selection status text would sometimes show an invalid text when no movies were showing in the list. Edit Multiple: F8 to clear didn’t work for memo fields like Plot and Notes. Edit Multiple: F8 in Movie format field would also clear Disc format field of first disc. Main Screen: “Edit in List” feature made it seem like “Extra Features” could be edited but it shouldn’t be editable. Screen started to “flicker” after leaving the program inactive for a few minutes. Delete key didn’t work in Month and Day fields to clear their values. Backspace did work normally.